If you're more than an average Hurtigruten enthusiast, here's your chance to buy your own Hurtigruten ship! 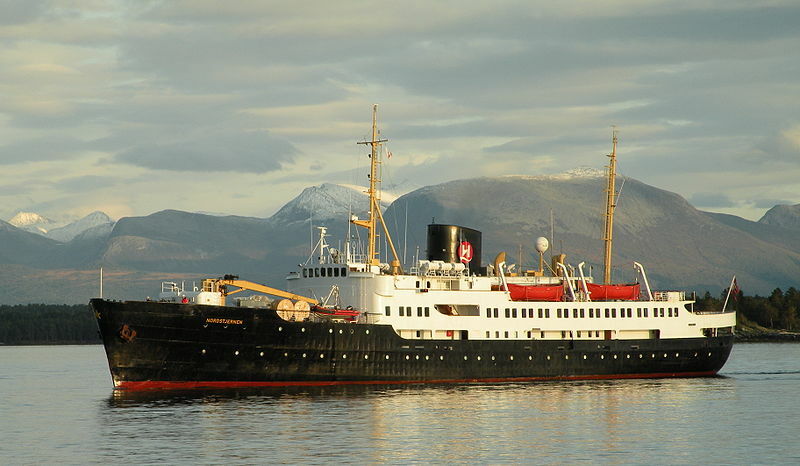 The MS Nordstjernen is up for sale on the Internet. According to Norwegian paper Avisa Nordland the price is in the range 15-20 million Norwegian kroner (about 2-3 million US dollars). Apparantly there's 8 interested buyers, from Croatia, Sweden, Denmark and Norway. The main purpose for buying MS Nordstjernen seems to be to operate her as a hotel ship. Some argue that the old ship should be placed alongside the former MS Finnmarken at Svolvær, at the Hurtigruten museum, but years have shown that taking care of one old ship is more than enough. It seems that being put on dry land is very hard on these old ladies, continous maintenance is required! There has also been some talk about getting her to Bergen, since this town has always been the starting point for the Hurtigruten voyages. The last trip for MS Nordstjernen is coming up, and many want to take part in the last voyage. Norwegian television is making a program about the retiring ship, and will have camera crew on the last voyage. 2012/11/13: According to an article in the Norwegian newspaper Bergens Tidende, MS Nordstjernen has now been sold to Indre Nordhordland Dampbåtlag in Bergen. The old ship will also be stationed in this town in Western Norway. MS Nordstjernen has also been set under the protection of the Directorate for Cultural Heritage, due to it's uniqueness and what this ship has meant for the coastal communities of Western and Northern Norway. This means that there will be restrictions on what modifications that can be done to the ship, if any. The ship can not be sold out of Norway. The interior, the art that was made by Paul René Gauguin and the whole ship has been documentet for posterity. The former owner Hurtigruten feels confident that the MS Nordstjernen will be taken good care of, says Communications Manager Ragnar Norum. For 56 years the Nordstjernen sailed for Hurtigruten, longer than any other ship that was in their fleet. Written by Skipskatta time: 3:06 p.m.